Update as of March 8th: Wow! I can't believe the response. The schedule is now full, but I want to give more people a chance to participate...so I'll be doing some round-up posts toward the end of the month. If you've got a book and activity you want to post about, just add the Read-Along button to your post (and becoming a follower would be nice too :) and send me the link to your post via email or in a comment on this post. I can't promise I'll be able to use all of them depending on how many people send me, but I'll highlight as many as I can. Thanks!! I can hardly believe that we're at the end of February with March right around the corner. When my mom was here last weekend, she reminded me that March 2nd is Dr. Seuss's birthday and March is Reading Month. Since we're huge book lovers at Helping Little Hands, I thought we'd have a little Read-Along. 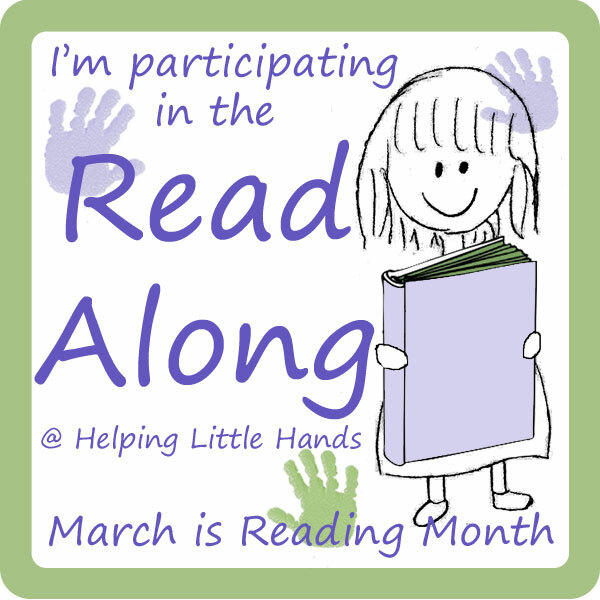 I'm hoping to have a children's book for each day for the month of March. I'll be sharing a lot of picture books and activities of my own (and some reading tips and such)...but I can't come up with a book/activity + post for every single day. (We've had a tendancy lately to skip our daily "preschool" time, so this will be good motivation for me to get back on track.) I'm hoping many of you will want to participate by sharing a favorite children's book and related activity of your own too! Choose a favorite children's book. Choose an activity to go along with your book. It can be a child's art project, an outing, cooking, a learning activity, or grown-up craft, just about anything goes as long as it enhances the reading experience. It doesn't have to be complicated...some of the simplest activities have been our kids' favorites. A book/activity you've done previously is fine too. In that case it would be nice if you're willing to make a mention of the Read Along in a new post on your scheduled day and/or repost the activity. Email me (polly.helping.little.hands (at) gmail (dot) com) and let me know you want to participate. If you already know what book you'll use, that's great or you can let me know later. You can also leave a comment on this post, but please me sure there's a way for me to contact you. Add the Read-Along Button to the sidebar of your blog. I'm not going to absolutely insist on this, but it would be a nice way to let others know about it. If you want to do a post letting others know about the Read-Along, that would be nice...but totally optional. After I know who wants to participate, I'll come up with a schedule. If there's a particular day you want, I'll try to accommondate. You can put your post up on your blog anytime on or before your scheduled day. Your post will be on your blog, and I'll put up a short post on Helping Little Hands sending people to your blog to see your Read-Along contribution. This should be a nice way to bring new readers to your blog and give us all ideas of fun books to read with our kids. Become a follower of my blog via blogger, Facebook, or whatever kind of blog reader you prefer to keep updated. I'll be keeping an archive list as we go, so at the end, there we'll have a great resource of fun kids books and activities. So grab a button and start planning your post! Love this. I'll be playing along for sure. Not sure of the book(s) yet, I'll know soon though! I'm in!! What a great idea! It's funny to have seen this post, a few days after my little one and I did an activity with Ten Apples Up On Top...Tee hee! We have decided to do stART project and I think it will be fun to play along. I can do a book. I'll send an email - what a great idea for Book Month! I'd love to participate! We have so many favorite books; I'm not sure which one I'd like to do. I sent you an email. Definitely would love to participate. I am a new follower. I'd like to participate. If you shoot me an email at angelinahook (at) hotmail (dot) com with what books are taken already, I'd love to pick one not already taken. I just sent you an e-mail and will ABSOLUTELY be participating! Thank you for putting this together! Just found you via books2bridgemiles. Would love to join in if you haven't already filled your March calendar. Children's books is all I post about, so just give me a day and I'll give you a title! I would love to participate! I have a Mommy and Me Book Club blog and we highlight a book each week and coordinate a snack, game, art activity, and songs with the reading of a favorite. Thanks!